The State Department just issued a press release stating that Secretary of State John Kerry and First Lady Michelle Obama will be honoring Samira Ibrahim with an "International Women of Courage Award." 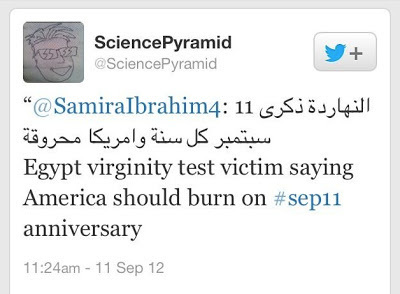 Interestingly, Samira is a Hitler-quoting anti-Semite who says she wants to see America burn. Gotta respect the intelligence of our leaders. What's next for Samira? A Nobel Prize? Five of these awards are being given to women from Muslim-majority countries, underscoring the unique plight of women in those countries. The only problem is that one of the women to be recognized is an anti-Semite and supports the 9/11 attacks on the United States. Ibrahim holds other repellent views as well. As a mob was attacking the United States embassy in Cairo on the eleventh anniversary of 9/11, pulling down the American flag and raising the flag of Al Qaeda, Ibrahim wrote on twitter: “Today is the anniversary of 9/11. 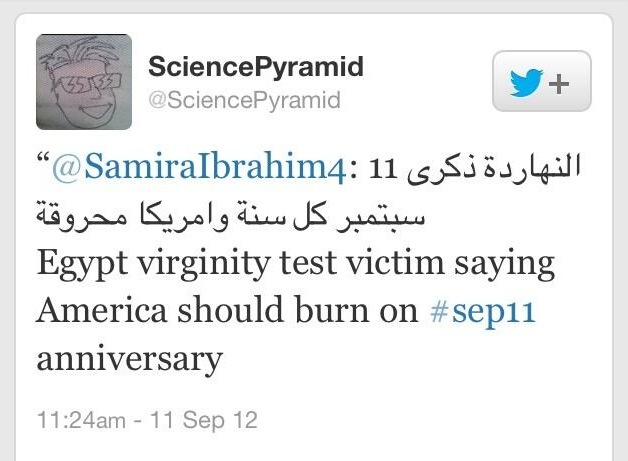 May every year come with America burning.” Possibly fearing the consequences of her tweet, she deleted it a couple of hours later, but not before a screen shot was saved by an Egyptian activist. Just today, apparently after having warned that her vicious tweets might cause her trouble during her visit to the U.S., she has written on twitter: “My account has been previously stolen and any tweet on racism and hatred is not me.” However, in the past she never made any mention of her account being “stolen.” The record of her anti-Semitic tweets is still available online. Pamela Geller has more here. WASHINGTON (AP) — The Obama administration is postponing an award for an Egyptian activist who rallied worldwide attention against forced "virginity tests" on female protesters because of anti-American and anti-Semitic comments discovered on her Twitter account. 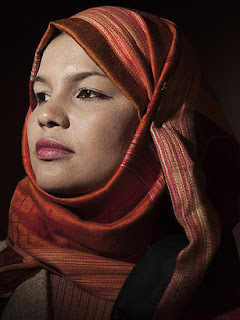 The State Department announced earlier this week that Samira Ibrahim would be among 10 recipients of the International Women of Courage award presented by Secretary of State John Kerry and first lady Michelle Obama on Friday. But State Department spokeswoman Victoria Nuland said Thursday the U.S. would hold off on awarding Ibrahim while officials investigate the tweets, which include support for attacks against U.S. diplomatic installations and praise for a terrorist assault against Israeli citizens in Bulgaria. Ibrahim, who has already arrived in the U.S, says her account was hacked, though the comments stretch back several months. This is so disgusting, I cannot wrap my brain around it. It is very apparent that the state department does not do enough research on its award recepients. This Samira lowbag of a person should never receive an award of this nature. Sometimes I wonder if the Obama administration secretly despises Israel. A case in point is that of Jonathan Pollard the Israeli intelligence analyst who has been in prison for 27 years for passing classified information to Israel. Despite repeated requests for clemency from President Shimon Peres, Prime Minister Benjamin Netanyahu and others, President Obama refuses to grant him clemency. I am seriously beginning to wonder if this administration habours a disdain for Israel. Instead they go out of their way to give an award to an anti-semite. God help us. Our very own First Muslim and his cabal in the White House consorts with Satan on a regular basis. Is Obama's second term over yet? She feeds herself on the Quran and Quran's main nutrient is HATE. Hate causes mental and emotional CANCER. Cancer kills LOVE. This woman, sick with emotional and mental cancer is only able to produces HATE. Or maybe a position as Resident Fellow at the American Enterprise Institute (AEI)? Ayaan Hirsi Ali is currently Resident Fellow at AEI despite her belief that Muslim rights should be violated at will. Consider what she believes and advocates. She believes in a “war” against all Muslims as such, that Muslims’ free speech rights should be violated, that Islamic schools should be shut down without evidence of wrongdoing or probable cause, and that the U.S. Constitution should be amended to facilitate these and other right violations (“The Trouble Is the West,‟” interview with Ayaan Hirsi Ali, Reason, November2007, available here: http://reason.com/archives/2007/10/10/the-trouble-is-the-west/singlepage). Those are the views of a self-professed “classical liberal” who not only receives praise for courage and rationality but whose work is linked here at AnsweringMuslims. If AEI can award a position of Resident Fellow to a “classical liberal” who advocates an indiscriminate war against Muslims, several right violations, and constitutional amendment, why can’t the Obama Administration award a clear-cut anti-Semite the International Women of Courage Award? She actually looks a little like Mona Eltahawy. Same self-righteous arrogance, although Eltahawy likes to intersperse the I'm-so-superior manner with a breathless coquettish gosh-I'm-just-a-girl type persona. Pretty off-putting affectation for a 40 something. As for this Samira female...you just know she spouts her vitriol with absolute relish. How amusing that she now denies her hate speech. I'll bet she is screaming inside at having to explain herself to the dirty kuffar. Hopefully someone will be monitoring her twitter account in the near future, to catch up on all the details of the nefarious Zionist plot to discredit her. The Jews are SO getting the blame for this. Islam is not a religion. It is a Political Ideology that has at its core the destruction of western societies. I'm trying to tell you all that our Pres and this administration are smarter than we would like to think. If they can discover that a pastor preached a pro traditional "anti-gay" marriage sermon 5 years ago and, therefore, should not speak at the inaugural prayer breakfast - surely they know what this misled woman has posted on Twitter within the last few months. This is O's second term and he has never been to Israel yet. And, when he finally does go, he shrouds the visit in demands of withdrawal. O is no friend of the Jew and a sympathizer with jihadists. Islam is not a religion. It is a political ideology that has at its core the destruction of all western societies. Now that the State Department has reversed itself on giving the award to this anti-semite woman Samira, I must say that it is a step in the right direction. Hazakim said, " If they can discover that a pastor preached a pro traditional "anti-gay" marriage sermon 5 years ago and, therefore, should not speak at the inaugural prayer breakfast - surely they know what this misled woman has posted on Twitter within the last few months"
Actually it was 15 years ago but this is the same pres who put 'Stonewall' (as in stonewall riots) right up there with other significant civil rights movements. It wasn't. The police were accosted by transexuals and gay men and had to barricade themselves inside the bar until backup arrived. They were there, by the way, because the mafia and owners of the club were blackmailing well-to-do gay men with being 'outed' if they didn't pay hush money. The police were trying to stop it from happening when the gays went wild. But you know...details. Shme-tails, right? Ok I will take on your logical fallacies. I dont know why I give you the time of day sense you do the same thing in every post. But its fun and easy exposing you. A fallacy is incorrect argument in logic and rhetoric resulting in a lack of validity, or more generally, a lack of soundness. A formal fallacy is an error in logic that can be seen in the argument's form. All formal fallacies are specific types of non sequiturs. Non sequitur (Latin for "it does not follow"), in formal logic, is an argument in which its conclusion does not follow from its premises. AEI is a private, nonpartisan, not-for-profit institution dedicated to research and education on issues of government, politics, economics and social welfare. Founded in 1938, AEI is home to some of America's most accomplished public policy experts. AEI's purpose is to serve leaders and the public through research and education on the most important issues of the day. AEI research is conducted through seven primary research divisions: Economics, Foreign and Defense Policy, Politics and Public Opinion, Education, Health, Energy and the Environment and Society and Culture. It also works through several specialized outlets, such as the National Research Initiative (which sponsors research by university-based scholars), the AEI Press, the Enterprise Blog and The American, AEI's online magazine. They are an INDEPENDANT think tank. Hirsi does not work for the government. @search for truth....THANK YOU! Derrick also makes an appeal to emotion (all those poor muslims who send her death threats)too, that also factors a bit into his fallacy. I honestly don’t know why you devote so much time to me since you never directly address my claims. But I’ll deal with yours. In other words, I am asking whether it is possible in principle to divorce Samira Ibrahim’s plight as a political activist from her anti-Semitic/anti-American views. It’s a legitimate question, one I would like to see answered without the remedial logic. I brought up Ayaan Hirsi Ali because she equally holds morally and politically culpable views yet her book is recommended on the right-hand side of this page and she is frequently featured in several posts here. She confesses to having little experience of the United States to know much about its rich religious/cultural diversity. Yet she advocates taking away the rights of American citizens, Muslim American citizens to be exact. To my knowledge she hasn’t altered her position. So: is it possible to divorce her plight as a victim of Sharia from her patently anti-American views? And it’s not just Ayaan Hirsi Ali, either. Pam Geller’s page is linked on the right-hand side, too, and she is cited in a few posts. I can think of a number of things to say about her, but none of them stands out as much as her NY subway ads. Ever read them? Here’s what one of them says: “IN ANY WAR BETWEEN THE CIVILIZED MAN AND THE SAVAGE, SUPPORT THE CIVILIZED MAN. SUPPORT ISRAEL; DEFEAT JIHAD.” The phraseology comes from Ayn Rand’s comments in a 1974 Ford Hall Forum speech. Regardless of the source, it’s quite anti-Arab in tone. Is it possible to divorce her political plight, whatever it happens to be, from her anti-Arab stance? Btw: I never said Ayaan Hirsi Ali works for the government. I answer all of your fallacious statements and questions. Your the who is selective in your responses and answering. Funny thing is you dont even realize your non sequitar. BECAUSE THE AEI ARE NOT A GOVERNMENT PROGRAM. THEY ARE INDEPENDANT OF THE GOVERNMENT. What is wrong with you? Thats like saying if a Nazi organization wants to award a position or a medal to one of it's members then the government should as well. The gpoevernment is a respresentative of the people and should not be biased toward any one group. The AEI is seperate from the government and they can do as they please. I business or idependant organization can do as they please, the government should not award medals to a fascist bigot. Any inde[pendant organization is not under these restrictions. AYAN HIRSI is not up for a medal from the government. If she were then you may have an argument. BUT YOUR COMPARING AN INDEPENDANT ORGANIZATION TO THE GOVERNMENT! DUH! I agree with a lot of people on many issues. Even some Muslims even though they are contradicting Islamic doctrine. But that does not mean I have to agree with them in every single issue. I agree with Davuid Wood the majority of the time, but I am sure there are some opinions he has that I dont. Your entire argument is a logical fallacy. There is no comparison between Ayn Rand's statements, or Ali Hirsi's in this issue, or Pamela Gellar. WHAT DO YOU WANT TO DO TAKE AWAY PEOPLES RIGHT TO FREE SPEECH AND OPINION? People are free to say what they please. When a government is going to recognize that person that means they are condoning their postion and charachter. People working for independant instutions or individuals are free to speak their minds. Ali stated she wanted out of government because she wanted the freedom to express herself. Your argument is null and void of logic and reason. If hisi was up for a medal from the government you would be feaking out and whining and complaining. You make no sense and your being hypocritical again! You dont even comprehend the disparity in your assertions! I honestly don’t know why you devote so much time to me since you never directly address my claims. But I’ll deal with yours. " No, Derrick. You never address his claims but I think this comes down to whether or not you recognize what a logical argument is. What S4T did was point out you're arguments are flawed from the get-go. You don't seem to understand it, and thus make more illogical arguments, fluffed up high on word and letter count. Sadly even in this post, you go on the offensive and even plagerize him. In your critique you associate muslim with 'American' when you say Ayaan Hirsi Ali wants to take away american rights. Ayaan Hirsi Ali is not anti-american because she critizes Islam. She does it because Islam is not just a religion, it's political ideology with lasting implications and more oppression for anyone not muslim. She was also raised in a muslim family and now has to be guarded from them because of that silly little thing called a fatwa. If anything the real oppressed person is Ayaan and muslims want to take her rights (to live) away. You said, " Regardless of the source, it’s quite anti-Arab in tone." The only way the slogan is 'anti-arab' is if you think Jihad is a totally arab concept and ignore the fact that NOT ALL ARABS ARE MUSLIMS DERRICK! Is it possible you've confused a nationality with a religious affiliation? Seems like it. Bottom line: You compare two things that have no association and think the analogy works when it doesn't. You also appeal to emotion. You use superfluous words to bulk up your arguments because you seem to think he who posts the longest argument wins. Just chill. Read more posts. Read more books. Learn what a logical fallacy is and how to avoid it. You absolutely correct. He cannot comprehend his flawed logic. He obviously has the ability to compose a sentence. But he cant think his way out of a paper bag. It's clear that grammar and sentence structure is not linked to logic. Derrick is evidence of that! And whats even more frightening is he claims to teach children. Scary! Part of me thinks he is so vested emotionally in Islam that it just comes out, hence the appeals to emotion inherent in his posts. That's why I've said over and over again to him if you're that upset, leave. Insulting someone doesn't do anyone any good and it's not like they take you seriously anyway. But something else is really going on. He's missing that filter that says 'wait a second, does this even make sense'. Either he was born and bred muslim and hence it wouldn't be there or he's a convert to islam and for some reason that part of his brain is no longer questions what he says and why he says it. That is truly the scary thing...and that he's teaching children but let's be honest, kids are scary enough on their own!!! I did notice something else though, in the rare instance cognitive dissonance kicks in he tries to relieve it with a personal attack towards David or someone not involved in the conversation or he pulls someone into a dialogue when drops it when they ask direct questions he doesn't want to answer. Albeit this time I hopped in to this one and you made excellent points. I had no choice but to do so. However, I can't help but think that he's drawn to this site and has to respond the way he does NOT because it troubles him that bad things are being said about islam...but that they're true. Responding, to him, is a way to avoid the trouble for a little longer. The reason I don’t respond to your long posts is because they often veer off topic. I’m restricted by word count, so I’m not going to devote an innumerable amount of posts just to deal with your topic-altering points. Here we are, days removed from my initial post on this topic, and you still can’t answer my question with any degree of accuracy. I hate to play teacher and tell you a thing or two, but: my question was purposely structured in a way to generate yes/no answers. As usual, you prefer to deal with tangential matters. Thus, this will be my last post to you (and Search 4 Truth) since you’re cognitively incapable of adequately responding to me. This beautifully illustrates why I’m no longer going to respond to your intemperate rants. I said Ayaan Hirsi Ali believes *American*Muslims’ rights should be violated at will. Since American Muslims are American, she does, in a sense, want to restrict the rights of at least *some* Americans. If you can’t grasp or articulate that simple point then you have no business lecturing me or anyone else on the elements of logic. In addition, I never said she’s anti-American. I said her views are anti-American. And they are. I don’t mean her views are anti-American in the way Osama Bin Laden’s views were anti-American. They’re anti-American in the sense they advocate doing away with what is essentially American: rights. America is a constitutional republic, and a core pillar of the American constitution is the protection of the rights of persons – Muslims as well as non-Muslims; in fact, “rights” form the basis of the First, Second, Fourth, Fifth, Sixth, Eighth, Ninth, and Fourteenth Amendments. To advocate, as she does, doing away with Muslims’ rights to free speech or to advocate the closure of Muslim schools without evidence of wrongdoing is to undermine the very thing the constitution protects. To paraphrase legal scholar Richard Epstein, to undermine rights is to undermine the very normative force of the constitution (See Richard Epstein, Takings: Private Property and the Power of Eminent Domain (Cambridge, MA: Harvard University Press, 1985)). Here’s another way: it’s anti-Arab because the phraseology of the ad comes from an Ayn Rand’s anti-Arab 1974 Ford Hall speech. In that speech Ayn Rand was talking about the “Arabs” in general. Accordingly, Arabs are nomadic and without culture or technology. They embody the essence of what it is to be a “savage.” The similarities between Geller’s ad and Ayn Rand’s speech are too close to be accidental. (Keep in mind that Geller’s blog is titled after Ayn Rand’s novel Atlas Shrugged) Your objection only works if Geller’s ad is specific about which people are indeed the “savages.” And it isn’t clear at all. The only thing that’s clear is the implication: anyone opposed to Israel on any subject is a savage. An ad like that by anyone else would earn him/her the label “anti-Semite” or some kin ascription. It certainly wouldn’t earn him/her half-baked rationalizations like the one you’ve just offered. But “savage” is consistent name-calling from folks like Geller, if you care to read people like Geller in full. It gets to the heart of why I’m here, and why I devote so much electronic space to responding to maladroit loudmouths like you. Whereas anti-Semitism can be easily identified (or at least we think we can identify it), Arab-/Muslim-bashing isn’t so easily identifiable, or it can be rationalized by pointing out the social/civic goal it achieves. Kick up as much hysteria about Muslims and the problems commonly associated with them, even if the problems aren’t specifically unique to Muslims; call them or their enablers “savages” or what have you. All that’s oblivious to you, I see. Your entire shtick is to take the moral high ground – not a very high one, actually – and question my logic, misrepresent what I say, and mock my efforts. So, I’m done with you. I won’t respond to you, read your dizzying responses, or give you one second of my time. Derrick said, "The reason I don’t respond to your long posts is because they often veer off topic. I’m restricted by word count, so I’m not going to devote an innumerable amount of posts just to deal with your topic-altering points"
Yet you did two posts. And yet didn't answer Search for Truth AT ALL. Then you said, " I said Ayaan Hirsi Ali believes *American*Muslims’ rights should be violated at will. Since American Muslims are American, she does, in a sense, want to restrict the rights of at least *some* Americans." The operative word here is 'in a sense'...hence another logical fallacy. She critizes Islam therefore she wants to restrict the rights of muslims. Second you made another under the rug appeal to emotion. Again. Your batting average stinks and I have yet to see one argument that works. But then..."If you can’t grasp or articulate that simple point then you have no business lecturing me or anyone else on the elements of logic." Really? So why not direct your post of Search for Truth? Oh, that's right. Also, what do I have to 'articulate' in your post. You're the one doing the talking bucko! And you're doing a terrible job at that. Next. "In addition, I never said she’s anti-American. I said her views are anti-American." A lot of views are anti-american according to you. Then you made another sweeping statement, "To advocate, as she does, doing away with Muslims’ rights to free speech or to advocate the closure of Muslim schools without evidence of wrongdoing is to undermine the very thing the constitution protects." One, this was a point you need to support with facts and you can't say 'well every time she opens her mouth'. Books she's published with page number reference. You could have had real bite here Derrick. But probably not because YET AGAIN YOU MADE ANOTHER ERROR! You appealed to emotion connecting an alleged statement made by Ayaan to taking away free speech and education rights to constitutionally protected rights when you still haven't established with facts. He said, "Here’s another way: it’s anti-Arab because the phraseology of the ad comes from an Ayn Rand’s anti-Arab 1974 Ford Hall speech. In that speech Ayn Rand was talking about the “Arabs” in general." Actually it's a slogan Derrick, regardless of where it came from. They're designed to communicate and convey a point in a short amount of time and be witty if you can help it. Honestly I didn't know Ayn Rand even said it. Seems you maybe the only one who knew that information. Regardless though, it's not anti-arab. "The similarities between Geller’s ad and Ayn Rand’s speech are too close to be accidental." And I already explained how slogans are made. "Your objection only works if Geller’s ad is specific about which people are indeed the “savages.” And it isn’t clear at all. The only thing that’s clear is the implication: anyone opposed to Israel on any subject is a savage. " Hold on for a second, first you say it come from an Anti-arab speech by Ayn Rand and therefore is anti-arab in nature but now you say, "it isn’t clear at all. The only thing that’s clear is the implication: anyone opposed to Israel on any subject is a savage. " You got tripped up in your own convoluted argument here because at first 'it's anti-arab' and now it's anyone opposed to Israel. And you try to rip into be for not being 'clear'. "But “savage” is consistent name-calling from folks like Geller, if you care to read people like Geller in full." I wouldn't know, I don't go to her blog. Then he said, "It gets to the heart of why I’m here, and why I devote so much electronic space to responding to maladroit loudmouths like you. " Ad hominim attack here. Just because you can't come with a valid argument you attack me (note: your response to Search for Truth is nowhere to be found). They ruin your argument but then again you got tripped up in the last one. "All that’s oblivious to you, I see. " Your entire shtick is to take the moral high ground – not a very high one, actually – and question my logic, misrepresent what I say, and mock my efforts." I didn't misrepresent anything you said. YOU AND YOU ALONE misrepresent everything you say. "Arab-/Muslim-bashing isn’t so easily identifiable, or it can be rationalized by pointing out the social/civic goal it achieves. " Let me know when the whole muslim community erects statues in your honor Derrick. Then don't be so mockable, but then you'd have to listen to people and actually respond to the arguments. Not trash them or their character because they disagree with you. "So, I’m done with you. I won’t respond to you,"
Like you're done with search for truth? or Arrow? Or David who has the good sense not to respond to you? Don't respond to me at all. I'm completely fine with that. But grow up and realize your outclassed by the other posters on this blog. Or like I've told you before, go troll somewhere else. Quote "This beautifully illustrates why I’m no longer going to respond to your intemperate rants. I said Ayaan Hirsi Ali believes *American*Muslims’ rights should be violated at will. Since American Muslims are American, she does, in a sense, want to restrict the rights of at least *some* Americans. If you can’t grasp or articulate that simple point then you have no business lecturing me or anyone else on the elements of logic. " HIRSI IS NOT UP FOR A MEDAL FROM THE PRESIDENT! You dont even grasp how your argument is faulty! You are incapable of objective reasoning, critical thinking, and intellectual integrity! AND WE ANSWERED EVERYTHING YOU SAID! Your delusional! Hirsi opinion is irrelevant to the topic. The topic is that this fascist, bigot Muslim woman was up for a medal. Hirsi is NOT! Your comparing apples to hand grenades! Its irrelevant what any other person on the planet says. The only logical comparison you could make is another person up for the same medal who is anti Muslim. But sense there are none, you have NO argument! Anyone can say what they want. And they will be judged by what they say. YOU ARE IGNORANT AND UNABLE TO COMPREHEND THAT YOUR ARGUMENT IS PREPOSTEROUS! You are also suffering from the Dunning-Kruger effect! We did not misrepresent what you said. We are trying to show you that your argument is flawed. To have your argyument viable you must present similar cases that an individual is up for the same medal that has stated anti Muslim, or anti Chr4istian, Hindu etc.. Your just throwing out people who are not related in any respect! This is flabbergasting how Dumb you really are. Yes I said it. Your DUMB! Moral high ground? If an argument is flawed then it is flawed. There is no morality involved. It either is or isnt flawed. And your argument is flawed! I am in awe of your stupidity! I made it as simple as I could. We both explained it perfectly. I dont understand how you can say we didnt answer you when it is clear we both did! All you do is use logical fallacies and deny when you are refuted. And denial is not a rebuttal! What you have done is use a false attribution! Inconsistent comparison – where different methods of comparison are used, leaving one with a false impression of the whole comparison. Ignoratio elenchi (irrelevant conclusion, missing the point) – an argument that may in itself be valid, but does not address the issue in question. Kettle logic – using multiple inconsistent arguments to defend a position. We could not have answered you any clearer! Just because you will not accept that your argument is flawed and you are unwilling to accept it, does not mean we did not answer CLEARLY! Search for truth said, "Your comparing apples to hand grenades!" Love this phrase. Can I use it sometime???? Absolutely bro. Excellent job. Peace and love! They are always "blowing themselves" up, literally & spiritually. Hey, much to Derrick's chagrin here's something completely on topic. That girl is an idiot. she claimed her account was hacked. now she is admitting that it was her. She is willing to accept an award from the very people she despises, got to love the irony here, so poetic.